On the second anniversary of John Galliano’s arrival at Maison Margiela the designer abandoned narratives and invoked social media as his point of departure. Galliano’s latest ‘Artisanal’ collection, which has been near universally praised as highlight of the couture shows, took aim at the increasingly popular Snapchat filters that distort, transform and obfuscate our faces. True to form, Galliano abided by the house codes of deconstruction and craftsmanship, splicing garments open to reveal their cage-like seams without losing a sense of sculpture, joy and unfettered creativity. One look, worn by Teddy Quinlivan, harkened back to Snapchat’s original filter with a white tulle shirt embroidered with a face vomiting a rainbow. On others, embroidered veils featuring abstract renderings of faces fell out of alignment with the models’ faces beneath, creating a disarming duality; other models’ faces and hair were threaded with fabric, creating more surrealist portraits by Pat McGrath. Some wore head pieces of high polish chrome, not unlike rear vision mirrors in which to take a selfie. But it was the breathtaking penultimate look, a long white jacket lined with black tulle that poured out to take the shape of a lifelike face, that undeniably struck a chord. 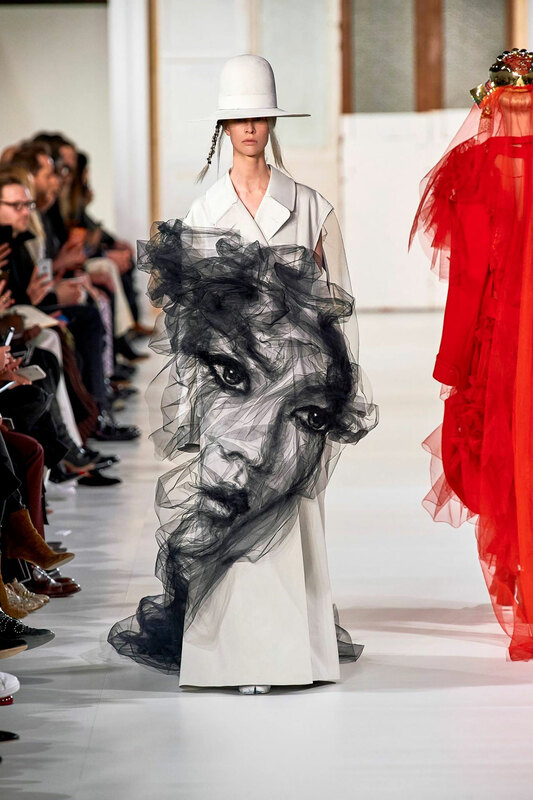 In an instant, images of the diaphanous look spread like smoke, which is as apt an analogy as any, as the collaboration between Galliano and the artist Benjamin Shine was pure ‘fire’. The Canberra-based, British born artist has made a considerable name for himself by creating portraits and sculptures predominantly using single lengths of tulle, hand-stitching, folding and an iron. To hear the artist tell it, Galliano – a long time fan of Shine’s work – and his creative team reached out with the proposal of a collaboration, and it was the designer who presented the idea of using a white coat as the canvas for the artist’s tulle work. British-born Shine has previously collaborated with other brands including Google, Coca-Cola and MTV, and has cultivated international acclaim through his projects in object, fashion and furniture design. Shine has also worked with Riccardo Tisci of Givenchy on a capsule collection of haute couture sweatshirts featuring Tisci’s signature images of the Madonna and child, and was once commissioned to create an official portrait of the late Margaret Thatcher using silk chiffon and iron. You can see more of his incredible work here.